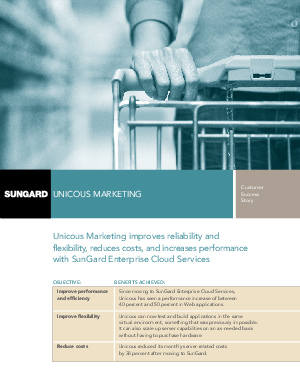 Improve performance and efficiency: Since moving to SunGard enterprise Cloud Services, Unicous has seen a performance increase of between 40 percent and 50 percent in Web applications. Improve flexibility: Unicous can now test and build applications in the same virtual environment, something that was previously impossible. It can also scale up server capabilities on an as-needed without having to purchase hardware. Download this whitepaper to see how Unicous reduced its monthly server-related costs by 38 percent after moving to SunGard.